This Commercial Table Skirt That Fits Two Table Sizes is In Stock Now! 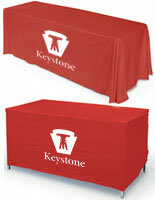 This Table Throw is a Great Tool for Trade Show Presenters and Banquet Hall Managers! Hook and loop attachments convert a table throw to fit either a 6 or 4-foot-long table. 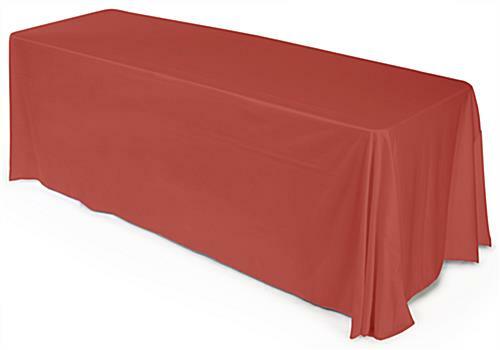 Red, premium polyester fabric is long-lasting, attractive & machine-washable. 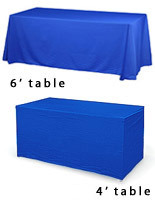 2-in-1 table cover is economically priced to save you money! This versatile table skirt covers the entire table from top right down to the floor. The tablecloth is machine washable and dryable. The wrinkle resistant fabric is also flame resistant. Included with the table skirt is documentation that certifies the fabric to be flame resistant. This commercial table skirt for sale online is perfect for use at trade shows and convention centers and is also ideal in banquet halls. 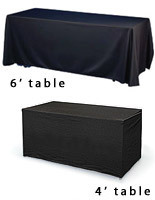 The adjustable size makes it the perfect choice for those that travel to many venues with differing booth sizes. 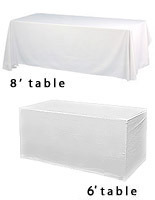 When you purchase this table skirt you are, in essence, purchasing two as these tablecloths convert to fit both 6' and 4' tables. 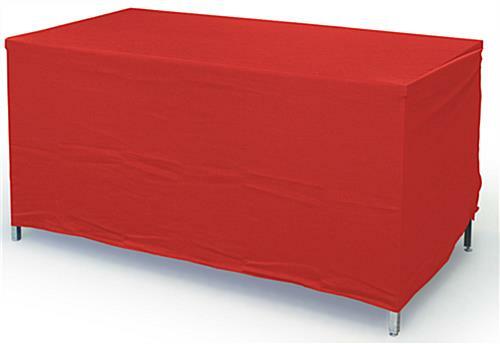 This discount table skirt that fits 6' and 4' tables has a bright red color that is sure to attract attention to every presentation. 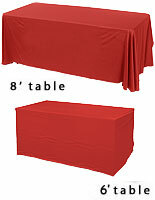 The tablecloth, often called a convertible table cover, has a elegant, draped look when used on a 6' table. When used with a 4' table, the fitted look has a more professional appearance. Conversion is easy as hook and loop tabs are used to hold the folded fabric in place. (Please view our instructions for more details.) This table skirt, often called a tablecloth, is the perfect choice for those that travel to many venues and may be limited by the space available within an exhibit area.